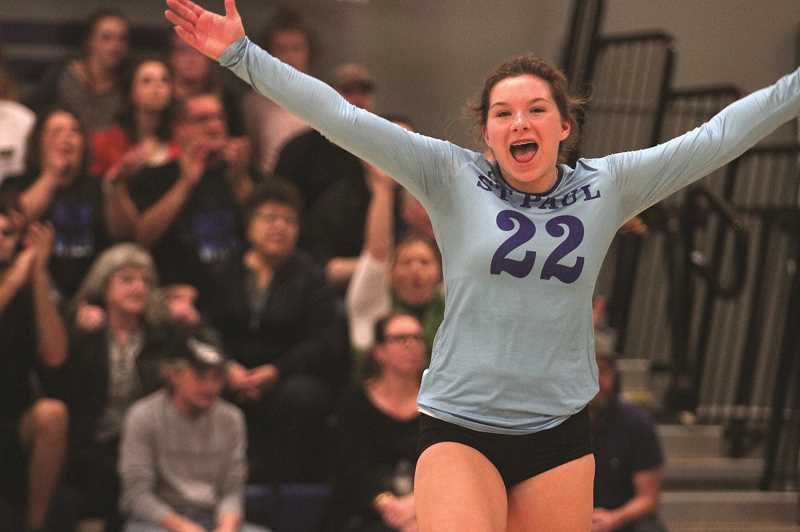 The St. Paul volleyball team made short work of its opponent in the second round of the 1A playoffs, defeating the Crane Mustangs 3-0 (25-16, 25-10, 25-10) to enter the quarterfinal tournament in Redmond this weekend as the top-seeded team. The Bucks had little trouble picking up their 27th straight victory of the season, using the team's superior serving to apply pressure early and often against the Mustangs. "Crane was a strong team, but our servers kept them out of system," St. Paul head coach Les Hiller said. "We hardly missed serving with only two errors." Junior Karlee Southerland led the way from the service line, going a perfect 24-of-24 with five aces. "She is our leadoff server, and it makes a huge difference to have her start a game strong and serve solid like she hass all season," Hiller said. "She also set phenomenal with 21 assists." Erin Counts, Emma Connor and Megan Tuck all were perfect from the service line as well. Isabellw Wyss led the team with 13 kills, and Counts had 11, adding five blocks on defense. The No. 1 Buckaroos (27-0, 14-0 Casco) are making a return to the 1A tournament after qualifying for the quarterfinals in seven consecutive seasons from 2007 to 2013 before St. Paul moved to the 2A Classification in 2014. Now that the Bucks are back in the 1A, the program seeks its first state championship berth since 1993, but must first face off against a familiar opponent. St. Paul opens the quarterfinals Friday morning against league rival and No. 9-seed Perrydale (26-6, 11-3 Casco). The two teams met three times during the regular season, most recently in the Casco League championship game, where the Buckaroos defeated the Pirates 3-0 (25-14, 25-11, 25-13). Since then, Perrydale has won two straight playoff games to return to the quarterfinal tournament for the first time since placing fourth in 2015. The winner of Friday's game will advance to the semifinals later that evening against either No. 4 North Douglas (26-6, 13-0 Skyline) or No. 5 Days Creek (21-8, 11-2 Skyline). The 2018 1A Volleyball State Championship will be held Friday and Saturday at Ridgeview High School in Redmond.